This is a photo I shot last year on Whidbey Island, WA. They are wild but so cute. I heard that their ancestors were runaways from a circus. Now there are so many of them around the fairground where the Whidbey Island Fine Art Studio (WIFAS) is located. Whidbey Island is a wonderful place. Beautiful flowers are all over. I am going back there on April 21 teaching a 4-day workshop. So far we still have openings. Please contact Cary Juriaans to Sign up. After coming back from FL, I have buried myself among a pile of paper works about finance. I must admit I am so ignorant about accounting and taxes. So I decided to learn it. I have been working very hard and hope I can put a control on my finance. I felt I would have forgot all about painting. Please give me some time. I will be back soon. The second demo took me more than a day. I got looser but try to keep the painting not to fragmented. With demo paintings, it is hard to take care of everything, but I kept a mental note and always look way to improve even more. I will leave Melbourne in a couple of hours. I hope this workshop helped in bringing your art to an higher level. 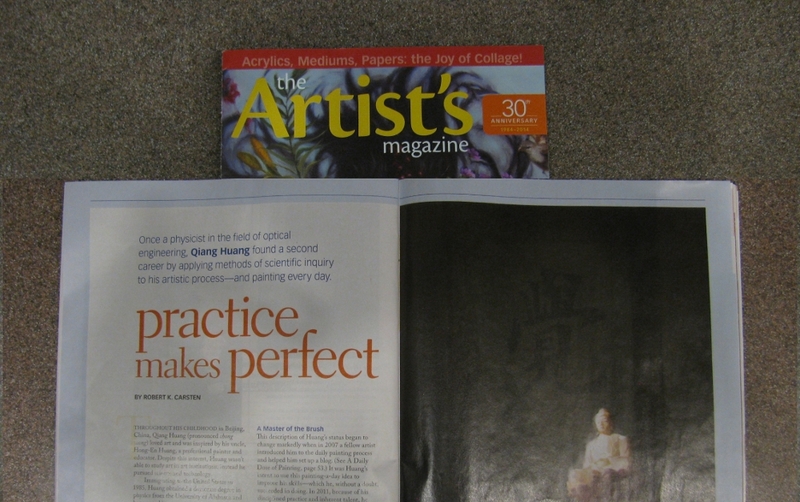 You might have noticed, there is an article about my art on the April issue of the Artist's Magazine. I think it is available in bookstores now. I am very honored to be featured in this magazine. The author Robert Carsten did a great job describing my approaches to still life oil painting. I hope this article can help you in your painting endeavors. My Melbourne workshop has started today. I want to thank Carmen Beecher and Brevard Art Students Guild for organizing this workshop. I so happy to see so many old friends and meet quite a few new friends. Thanks to all the artists for participating. This is my first demo. The setup was so complicated today. I felt a little rushed, but the painting turned out all right. On this paradise island, it will be a shame if I don't paint plein air. On the third day of the workshop, I set up my easel on the harbor and painted this quick sketch. On this island I see vibrant colors all over. But when I paint, I did not use too much colors, I try to put control on how much pure paints I use. This painting was really an experiment. After I return home, I will work on the color scheme for my seascape paintings. Wow! It is so exciting to wade into new water. Song and I are leaving Hope Town today. My next station will be Melbourne FL. The second demo I show how to paint silver, glass, and flowers. I enjoy the soft and disappeared edges. After doing so many demos, I have found more opportunities. Since demos tend to be repetitive, I got more chances correcting previous mistakes. So the brushwork gets more efficient and structure gets more accurate and delicate. When I am not teaching workshops, I explore new territories. When I demonstrate during workshops, I refine my craftsmanship to make paintings more dramatic. I feel a little odd painting still life in the beautiful Bahama Islands, but I did it anyway. I want to thank Christy Young and Robbie Bethel of the Hummingbird Art Center for putting this workshop together. Thanks to all the participating artists for attending my class. This is my first demo. Song has found a typo in my previous post. We are in Hope Town, not Home Town. I think you can read my subconscious mind now. I really wish here is my home town. It is exceedingly beautiful. This is watercolor. No, I mean real water color. Well, I should say it is the color of water. Now you got it. This is not someone's abstract painting. It is a photo I took from the sky. Song and I was on our way to Home Town, the Abacos. I was so amazed by the beauty of the Bahamas islands. I really like this piece of art. Two days have been spent on this painting. 90% of the time, I just stared at the board thinking. "Painting by not painting" was the goal for this painting project. I tried to paint as less as I can but wanted to show as much as possible. I painted rather abstractly, but still representational. The process was painstakingly slow, but it looks spontaneous and fast. Do all of these sound oxymoron to you? Maybe I should call this approach: the oxymoron style. This is the logo I put together last year for our Painting in China trip. Several months have passed, the wonderful memories are still vivid. Recently, my son Jonathan has made a video and placed it on Youtube. Please click: Painting in China 2013 Video to view it. Now, I would like to use the same logo to announce our Painting in China 2014 trip. We will go to China on September 12 to 26. We will visit and paint a few places different from where we have been last year. Please click: Painting in China 2014 Website to get the detailed information. Please join us if you are interested in this exciting trip. We are looking forward to having fun with you this fall. I have placed a widget of this trip on my blog so you may check the website any time. The third red rose. I toned down the chroma of green colors to harmonize the painting a little better. I don't know if you have noticed, that the digital camera can not capture the red colors sensitively. It can not show the subtle color change in value and hue. If you make your red move toward orange or purple, you will not see the difference on the photo, but you will see very obviously changes on the painting. In other word, the camera has some degree of red-orange color blindness. This is my second try of painting a red rose. I learned from my yesterday's painting that making the center of rose dark is not easy. My alizarin is too transparent. If I paint it directly on the a white surface, the value is not dark enough. If I mix with ultramarine blue, soon the color will look dirty. To solve this problem, today I tried the following: I painted the center of the rose with acrylic burnt umber first. After It dried (about 5 min), I painted alizarin on top. The umber makes it dark and the alizarin makes it red. Is this process called "glazing"? I am not sure. I might have reinvented the wheel, but it worked. Why do I use burnt umber? Well, that was because I don't have other acrylic colors (except black) in my studio. I am so glad I come back to my daily practice. Now is the red rose season. So I would like to paint some. Red is a difficult color. It is rather hard to vary the value of red while keeping its high chroma. In general, I like to use alizarin for the dark, and cadmium red for the light. I put this painting into a 5 days auction. So the buyer may receive it before the valentine's day. "Morning in Zhouzhuang (Day 5)"
Now this painting is finished I consider. I will send it to the 23rd Annual National Juried Exhibition of the Oil Painters of America. So please wish me luck. I enjoyed this painting project. The semi abstract background really gave me challenge and opportunity. I was hesitated and clumsy, but gained some experience. I thought this painting is 12" x 16", but I was wrong. I was trying to find a frame for it today, and just realized it is 11" x 14". Qiang, you make more mistakes than before. "Morning in Zhouzhuang (Day 4)"
I worked on the background of this painting. On the foundation of value and color, I added more details. I want to keep the background abstract enough, so it will not overwrite the center of focus. This painting gives me lots of opportunities working on texture, brush, and knife work. They look easy, but actually they are not. I really need this practice. These a couple of years, I found my memory has deteriorated significantly. I have forgot many things I have learned from my previous studies. So now, I write down my thinking process when I do a painting. so I can go back to review what I have learned. If I paint only intuitively, I will not progress. So paint intentionally. Time is getting more precious than before. I may not be able to afford this commodity in the future.